The Foundation for Chinese Performing Arts presented 19-year-old pianist Eric Lu before an admirable turnout at Jordan Hall. Lu was called back for two encores after a smashing rendering of Prokofiev’s monstrously virtuosic Sonata No. 7. By concert’s end, little doubt remained as to Lu’s extraordinary facility, his nearly flawless playing, power, and lightning speed. This young performer already has garnished prizes and performances here and abroad. And for his age, he is already making remarkable rounds on the international scene as a concertizing pianist. 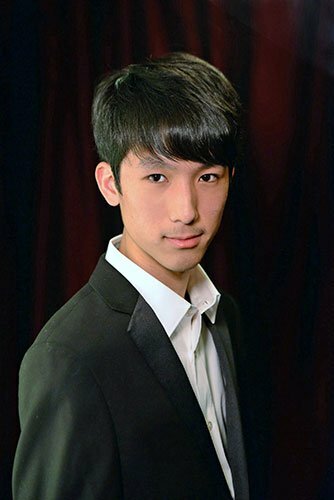 A native of Massachusetts, Lu studied at the New England Conservatory Preparatory School and currently studies with Robert McDonald and Jonathan Biss at the Curtis Institute of Music. Throughout Lu’s Saturday evening performance queries naturally come to mind about practicing in order to achieve sheer measures of piano prowess and how much of the interpretative side of playing comes from such widely respected teachers as those at the revered Philadelphia music school. With but a few miss-touches, Lu swept through the first of twenty-four Preludes, Opus 26 by Chopin. Low murmurings of the left hand fit fairly well with the right hand’s melody, a bit over-articulated. The F-sharp minor bass clef thrusts seeded motion. The famous E minor gave the first glance of a kind of questioning and answering value to the otherwise continuous melodic line. This happened again in the equally well-known A major in which a two-bar phrase is pronounced more or less the same way eight times (prompting the late Professor of Music at Harvard, Luise Vosgerchian, to recite “a rose is a rose” as many times, suggesting her understanding of the melodic structure). Louder and softer pronouncements from Lu inferred call and response, or call and echo. On the faster side under Lu’s prodigious hands, the Molto Allegro C-sharp minor sparkled, the Vivace B minor filled with percussive agitation, and the Presto con fuoco in B-flat took phenomenal flight via swift swirling crescendo-decrescendo intimations. Over in a blink or two, the Molto agitato in G minor blurred. Surprisingly, Lu underplayed repose and rubato. Later on, his whizzing up and down and around the keyboard would become strength as in the concert finisher, the Prokofiev. Lu rendered Mozart’s Rondo in A minor, K. 511much like a good deal of the Chopin. Here, his ideas unfolded still more. The simple harmonic patterns of the left hand softened almost to vapors, the chromatically oriented melody grew pointedly louder, flurries of trills and embellishments came often even more loudly stated. Certain subtleties in Lu’s iteration of Franz Schubert’s Impromptu in C Minor, Op. 90 D. 899 No. 1 might have shed light on things to come from Lu. His delicate triplets imaginatively cushioned the secondary theme; his loving caress softly touched those beautiful Schubertian sequential passages. The “Scythian” beats and rhythms of Sonata No. 7 in B-flat Major, Op. 83 by Sergei Prokofiev, in combination with the big Steinway and bantam-weight Lu were a near-perfect fit. The slower second theme group of the first movement and the gorgeous Gershwin allusion that is the go-to slow theme of the second movement took to stylization as heard in the other entries on Lu’s program, namely declaring melodic substance while understating harmonic connectivity. As to the Lu’s grasp on the fast, especially the Precipitato, it was way out there with blinding technique and formidable energy such as that of a rock super star. It remains to be seen what lies ahead for this conqueror of keys, where he will find his own personalized voice. As for now, for those who caught Eric Lu in concert at Jordan there was certainly more than enough from the 19-year-old to bring his audience to its feet, asking for more. For his two encores, he illuminated Schubert’s Impromptu Op. 90, No. 2 in E-flat Major and the Bach/Siloti Prelude in B Minor. God bless Cathy Chan and her Foundation for presenting 19 year old Eric and other young artists who are trying to build careers. Eric gave an incredible concert that was every bit as good as some of the Celebrity Series artists I have seen. His concert made a statement. Kudos to his amazing teachers A.R. Rivera and A. Korsantia. Given that Eric grew up in Boston, it is curious how little he has performed on the local scene. He makes appearances with orchestras around the world but not in his home town? What’s going on? Shame on Boston. We have to do better at finding and nurturing young talent and giving them opportunities to play. Boston should be front and center in helping to launch his career. It is people like Eric who help put Boston on the map and he should be a source of community pride. We can only hope that this concert will be the door to more opportunities here and abroad. Congratulations to Eric and I hope to hear more from you! Keep it up!